After such an eventful night in Panama City, we were slow to get moving the next day. 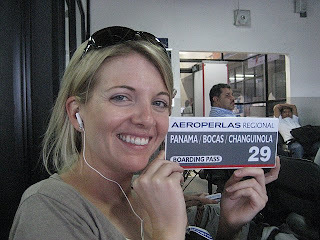 Which was fine, because we didn't have any place to be until the afternoon when we were catching a flight to Bocas del Toro. Ahead of our trip, I wanted us to leave on the 7am flight, but Maribeth thought it'd be better for us to leave later, knowing that we'd be celebrating her birthday the night before. When I woke up on Day 214, I'd never been so thankful to not get my way in my life. 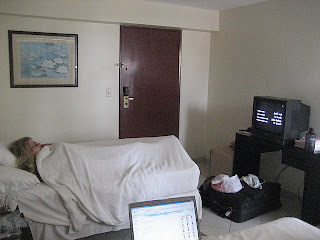 When we'd first arrived in Panama days earlier, we'd found a television station that played reruns of popular American television shows like Seinfeld, Friends and Beverly Hills, 90210. We'd leave it on in the background when we were waking up and when we were getting ready, but until Day 214, hadn't really invested a lot of time into watching the network. At the risk of revealing to you the ugly Americans we are, I'd never been so happy to lie in my air conditioned hotel room and watch TV. Day 214's thing I've never done before was to watch an episode of Felicity. In Panama. So maybe watching a stupid American television show wasn't the best way to soak up the culture of Central America. But I really didn't feel bad about it at all. In fact, our ability to waste this much time cooped up in our hotel room was, in my opinion, the greatest thing about traveling for so long. I especially didn't feel bad because Felicity, I found out, is awesome. Attractive people in unrealistic scenarios, talking to each other in dialogue that no human ever uses, story lines so heart wrenching that crying at some point during every episode is nearly required. What's not to like? Felicity is played by that girl that looks like the Noxzema girl, but isn't. The episode we watched took place on Thanksgiving in New York City where Felicity and her friends go to college. Only they don’t live in dorms, they live in these insane New York City apartments. And they don’t get sloppy drunk and make bad decisions, at least not in this episode. And two of them are married to each other. Felicity and a really good looking guy named Ben were in some sort of fight or something, and they were avoiding each other. We had to watch nearly the entire show to deduct that the two were dating, but Felicity had recently cheated on him. Ben decides, then, to show up to the Thanksgiving dinner thrown by the married couple with another girl and things get really awkward. Felicity storms out, and then Ben and other girl storm out. And then other girl realizes she's just the rebound girl so she leaves Ben standing on the side of the road. By the end of the episode, Felicity and Ben somehow end up back together and then everyone is weirded out about that. The only thing that was remotely realistic about this show was that Felicity and Ben's way of making up with each other was to get busy. The rest of it: the fact that all of these college-aged people were eating Thanksgiving dinner together and not with their families, Ben’s dramatic run to the airport to rescue Felicity, the constant introspective dialogue. That stuff never happens in real life. Or maybe it just never happens to me. Midway through the drama Maribeth looked at me and asked me several times, "What's going on with her and that guy?" "I don't know," I told her. "I've never seen this show before either." "You don't know? !," she would yell from under her covers. "I want to know!" These questions weren't just coming from her, though. I wanted to know each character's back story as well. Out of habit, we'd alternate asking each other questions like, "Now who is that guy?" or "Do those two date each other?" throughout the episode forgetting that neither of us knew anything about this show. "How did we never watch this show when we were in college?" Maybe because we were actually enjoying college. Real college. Where people show up in sweat pants to class, if they show up at all, drink cheap beer out of kegs and flippantly enter and exit relationships without a lot of dramatic conversation. We hoped that when the hour-long episode was over we'd get another dose of Felicity to see what happened with her and Ben and maybe understand more of their history. But instead it was back to back episodes of Seinfeld that's we'd both seen several times before. We were forced, then, to get up and get packed to leave. Later that day, after milling around the 24-hour Panamanian grocery store near our hotel (something I’ve never done), we headed to the airport. The airport we flew out of was a little building outside of the city. We arrived, checked in, and were given our tickets, which were plastic tablets that we had to hand back to the airline attendants waiting at the bottom of the stairs outside the plane before boarding. 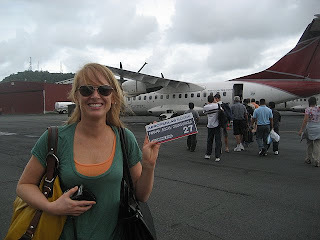 When Maribeth and I flew to Vieques, Puerto Rico a couple of years ago (yes, she and I are like an old married couple, traveling as a pair), the airline attendant literally asked me how much I weighed so he could figure out how to balance everyone on the plane. 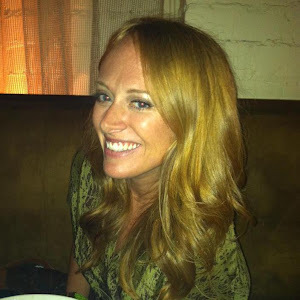 As I opened my mouth to respond, Maribeth joked, "Now’s not the time for vanity, Stephanie." She knows me too well. We laughed, and then I told him how much I really weigh. I expected that with this small plane they might do the same, but no one asked me how much I weighed. Instead, they just looked me over like I was a piece of meat and said, "Sit in the middle." Not exactly scientific, but we landed safely, so I'm assuming it works. And just like that, the beach part of our vacation was underway. Maribeth and I were excited. Nervous about Felicity and Ben, but excited nonetheless. How have you never seen Felicity!? That is the best show on earth - other than LOST and Gossip Girl, obviously. I'm with Amanda on this one.. I suggest you add it to your Netflix que asap.